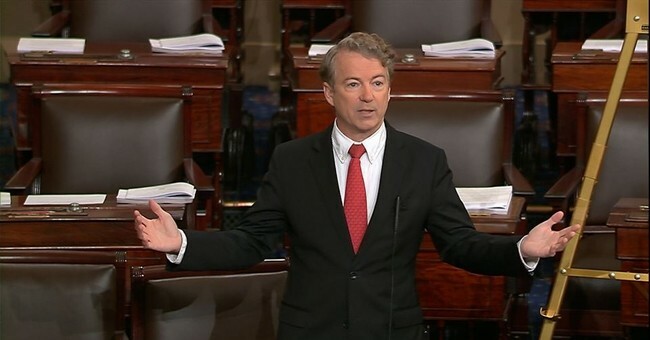 Sen. Rand Paul (R-KY) caused a government shutdown Thursday evening with his protest of the increased debt that the Senate budget deal would cause. "I can't in all good honesty, in all good faith, just look the other way because my party is now complicit in the deficits," Paul said on the floor of the Senate. He objected to the deal’s lifting of budget caps over the next two years, which will add to the deficit. The deal lifts the debt limit and increases spending by about $300 billion for both defense and non-defense items. Paul held the Senate floor until the Senate recessed at 11 p.m. Thursday, blocking a vote on the deal and triggering a brief government shutdown. According to Senate rules, the chamber has to wait two days, in this case until early Friday, to vote on a bill after the House sends it over unless there is unanimous consent to vote on it earlier. Paul objected to the unanimous consent rule and blocked the bill. The Senate is holding a vote on the budget deal at 2 a.m. Friday, with the House planning to vote between 3 and 6 a.m., as Congress rushes to re-open the government in the early hours of the morning. "I'm not advocating for shutting down the government," Paul told Fox News Thursday before going on the Senate floor. "I'm also not advocating for keeping the damn thing open and borrowing a million dollars a minute." Update: The House passed the budget measure 240-186 at 5am Friday after it passed the Senate despite opposition from some Democrats and members of the House Freedom Caucus.